The babybee prams Comet Plus is an upgraded version of the original babybee prams Comet which you can read my review for here. It also has many of the same great features of the original. It’s a reasonably lightweight 10kgs with the main seat and 10.5kgs for the bassinet. It has an adjustable handlebar that goes up to 101 cms high. And is just a great all-round, mid-sized, mid-priced, pram. 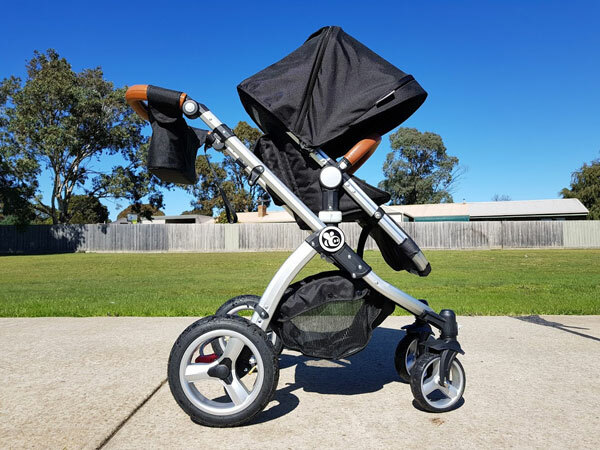 The babybee prams Comet Plus is $599, so it’s a little bit higher priced than the original comet (which is $499), but I think the upgrades offer some great value for money. One of my favourite thing about the babybee prams is they come with the bassinet included. The bassinet and the main seat use the same round frame. So when your baby has outgrown the bassinet you simply remove the bassinet fabric and replace it with the seat. The bassinet has lovely soft washable liner and quilted fabric around the interior walls. 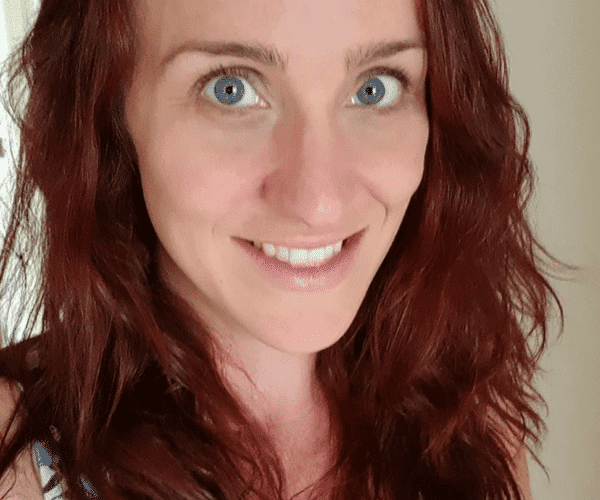 And the bassinet has a couple of pockets on the front, which would be handy for keeping small items that you might need easily accessible – such an a pacifier or a small packet of wipes. Also the bassinet can be removed from the pram and placed on the floor. Though note the belly bar is not weight bearing so you will need to carry the bassinet by the base. The seat is a pretty good size. It’s 30cms wide, 49cms to the top of the back rest and 56cms to the top of the hood. So it’s not a huge seat, but it’s average for a mid-sized pram. It should fit up to about a 3-4 year old. It also has four recline positions. The sitting position is a nice upright seat, so it’ll be great for older babies and toddlers who like to sit up straight. Also the height of the seat is great for parking up at a table, so you can use it as a high chair while you’re out and about. Though it is a two handed recline, and I do prefer a one handed recline. But that’s just a personal choice. The babybee prams Comet Plus comes with a heap of accessories. My favourite of which is the travel organiser. 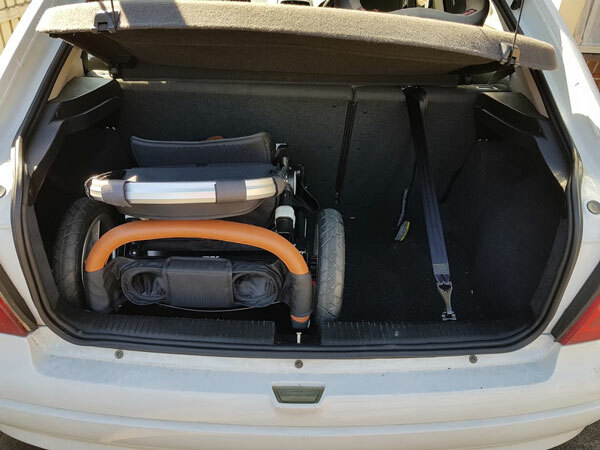 Between the pockets on the back of the seats, the travel organiser and the reasonably large basket there is so much storage on this pram! The other accessories are the foot muff for the bassinet, rain cover, super soft seat liner, and mosquito net. 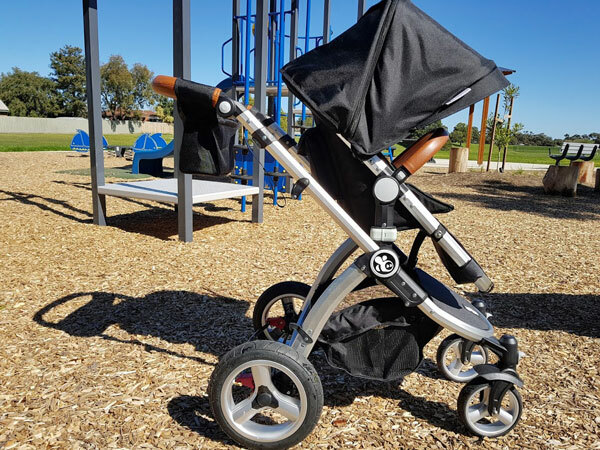 Additionally you can purchase seat adapters, a ride-on toddler board, and “colour packs” to give your pram a make over. The fold is simple and easy. You can leave the seat on, in the forward facing position, or take it off to make the fold more compact. The fold has an automatic lock and it is easy to pop back open. It’s also quite compact, it fit easily in the boot of my Holden Astra, with a bit of space to spare. And I even managed to squeeze it into the back of a tiny Suzuki Swift. Though I had to remove the back wheels, belly bar and seat to make it fit. I wouldn’t want to be doing that every day, but it is possible to dismantle it to squish it into tight spaces. 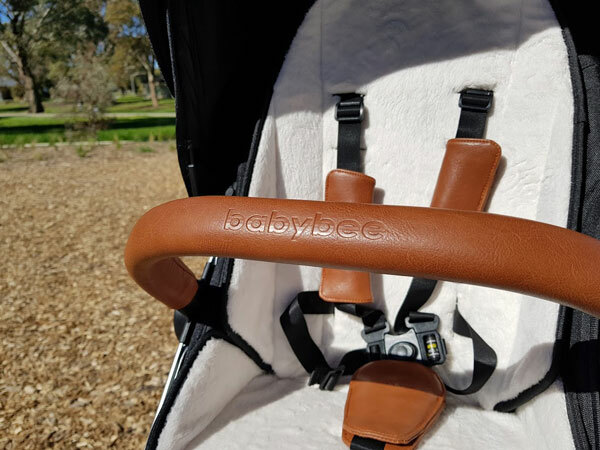 I took the babybee prams Comet Plus for a spin across a variety of surfaces – footpaths, roads, grass (which was very soft and a little muddy from recent rain) and playground mulch. It handled beautifully on sealed surfaces, and it worked well with the little bit of off-roading. The large, air filled, rear tyres give the pram a smooth ride. That said the front wheels did catch on some of the larger bumps and needed to be “popped” up on the rear wheels to go over them. So I’ll say that it’s a robust city and suburban pram, but it’s not an all-terrain pram. 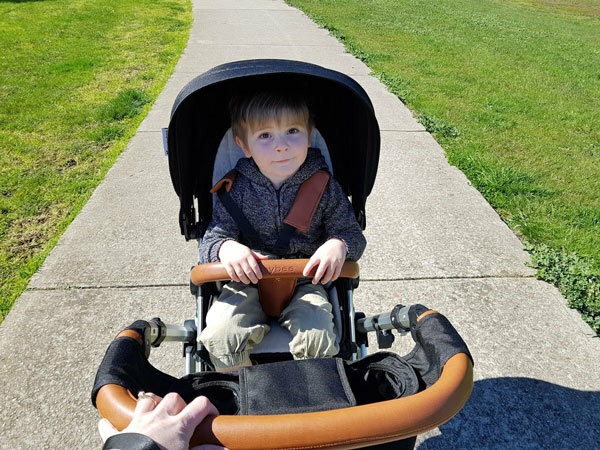 In conclusion the babybee prams Comet Plus is really great value for money, it’s a easy pram to use, easy to fold, and great steer around. It’s very thoughtfully designed and I love the included accessories and bassinet. Overall it’s a lovely mid-sized, mid-priced, all-rounder pram. 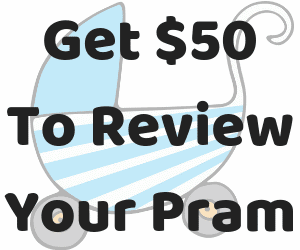 NOTE: This review affiliate link.